The Blue Garden is like a waking dream. The geometry is so precise, the features so mythic, that the garden looks more like a landscape painting than an actual place. Even in photos, the Italianate design inspires awe. But to fully appreciate the grandeur of this privately-owned Newport landmark, you have to know its century-long story of decline and rebirth. The Blue Garden was commissioned in 1908 by Arthur Curtiss James, a successful industrialist, and his philanthropist wife, Harriet Parsons James. Their family was among the wealthiest in the country, and their estate won national attention for its opulence – thanks in large part to the Blue Garden’s designer, Frederick Law Olmsted, Jr. The 38-year-old architect was already renowned for his own work, but he also had famous parentage: Frederick Law Olmsted, Sr., designed Central Park in Manhattan, among countless other landscape masterpieces. The Blue Garden was completed in 1913, to the astonishment of the general public. In keeping with its classical beauty, the owners hosted a party and performance, The Masque of the Blue Garden, attended by 300 people, on a balmy August evening. Visitors saw reflective pools, granite columns, and a meandering waterfall. Grassy paths guided them past potted trees and a dazzling spectrum of flowers. The client was Dorrance Hill Hamilton, a legendary Newport preservationist, who wanted to bring James’ Blue Garden and surrounding properties back to their original splendor. She assembled a team of experts, including historian Arleyn Levee, Massachusetts landscape architectural firm Reed Hilderbrand, and Glenn Parker, president of Providence-based Parker Construction. They found the original Olmsted drawings and digitized them, which helped Vance and her collaborators envision the refurbished terrain. 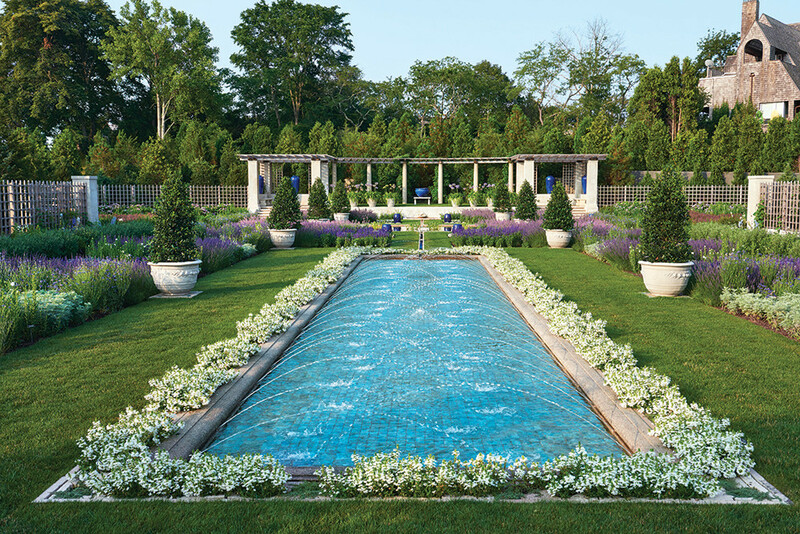 After a two-year restoration process, The Blue Garden reopened in 2014. The garden isn’t an exact replica; the pools use modern fountain technology, and the new plantings had to be manageable for two gardeners, not 30. But the new version is so faithful to the original that a casual visitor, traveling through time, might struggle to spot the differences.